book festival | Life Is A Festival! When events are successful in one place, it often makes sense to send them travelling so that people in other cities and countries can enjoy them, too. The fourth UK edition of the Jaipur Literature Festival, taking place in the Pink City every January and started by writers Namita Gokhale and William Dalrymple in 2008, was held for the first time at the British Library, from 20-21 May 2017. I was looking forward to exploring a culture and its literature which I knew very little about before the festival, although India has been on my bucket list for quite some time. The diverse two-day programme with authors from across the globe was made up of 30 tempting sessions for literature lovers and also offered some beautiful Indian live music, including a lively set by amazing Mumbai-based band Kabir Café on Saturday night. I did my very best to attend as many of the events as possible and came home with some great stories and lots of fascinating reading material in my very beautifully designed festival bag. The very first event on Saturday morning was a live music session with singer Vidya Shah and poet Arundhati Subramaniam introducing us to some mystical devotional Bhakti poetry in the Piazza tent set up for the festival in the courtyard of the British Library. I stayed on for ‘The Beatles in India’ with Beatles biographer Philip Norman, who had some very entertaining and surprising stories on the band’s time at the ashram of the Maharishi Mahesh Yogi in Rishikesh. Academic Rachel Dwyer’s interview of Bollywood director Karan Johar was predictably popular. Having not been much of a fan of this genre of film before, it definitely made me curious to find out more about its history and place in Indian culture in future. One of my favourite panel discussions on Saturday was ‘Migrant Words’ with writers Amit Chaudhuri, Lila Azaam Zanganeh, Meera Syal and Prajwal Parajuly very ably and humorously chaired by Anita Anand. The panellists shared their thoughts on and issues with identity and home, which all of us not living in the countries we were born in can certainly identify with. One of the most surprising and enlightening events for me was ‘The Genetics of Skin’, which I hadn’t originally had on my to-attend-list. Dr. Sharad Paul talked eloquently about the history of the human skin and skin colour and how it affects our health in a myriad of ways. The ‘India Votes’ as well as ‘The Rise and Fall of Mughal Art’ sessions were a great reminder why I love festivals so much as places of informal learning, as I picked up a lot of information about Indian politics and art. While most of the other attendees I spoke to had a connection with India and therefore an obvious reason for being there, there were also other members of the audience who had been brought along by friends or were planning a trip to India in the near future. As far as I’m concerned, festivals which promote a particular culture or country are a great place to do research for your travels as – unlike in most regular guide books – they provide you with up to date information on current events (e.g. recommendations for The Sacred Pushkar Festival and The Ragasthan Festival) and access to lots of knowledgeable people to quiz about your chosen destination. The second and last festival day was equally busy. The ‘Footloose’ travel session, which was one of my favourites purely because it was such a pleasure to hear some of the top travel writers read from their own work, in this case William Dalrymple, Anthony Sattin, Hugh Thomson, Samanth Subramanian and Monisha Rajesh. A little later, British writer Giles Milton told us the fascinating story of ‘Nathaniel’s Nutmeg’, which highlighted the many issues and quite gruesome conduct during colonial times. Food for thought indeed. ‘Shaping the Novel’ with writers Kunal Basu, Sarvat Hasin, Amit Chaudhuri and Tahmima Anam discussing the art of novel writing with festival director Namita Gokhale and ‘Ideas of India’, a panel discussion with some of the festival authors, were a real treat at the end of this wonderful festival, which was illuminating in so many ways. Most importantly, it has put India on the map for me and I’m not just talking about its vibrant, diverse culture, but the many individual voices I listened to over the weekend, the identities this vast country is shaped by and their hopes for a common humanity, which we can all learn from. On a more practical note, all weekend the three festival venues inside the British Library, the large knowledge centre theatre, the Piazza tent and the BL foyer (these events were free to attend, which was good to see given that all events at the original festival are free, too) were brimming with lively energy. I have rarely seen such a smiley – even if naturally extremely busy – festival team. Every single event I’ve been to was very well attended, which suggests that the organisers might look into expanding the venues in the years to come. It would also be lovely to see additional, possibly more interactive events, in order to draw in a younger crowd, too, as well as some Indian food and drink to also get to know the various flavours of Indian cooking. Quite exhausted from the two-day literature marathon, but very happy to have learned so much about the many different Indias, I am now even more keen to make it to Rajasthan for the original Jaipur Literature Festival, which is the largest free festival of its kind. Those of you based in the USA or heading there later in the year might like to know that the festival will also be travelling to Boulder, Colorado (another place on my ever-growing bucket list) in September 2017. You just can’t escape extraordinary literature! Disclaimer: Life is a Festival was provided with a press pass for the festival. Have you ever wanted to go to a place where everything revolves around books, where you can spend a whole weekend browsing tons of second-hand bookshops all without leaving the little town you’re staying in? Then the world’s first ‘book town’, Hay-on-Wye is definitely for you! Since Richard Booth (bookshop pictured below) opened his first bookshop in the little Welsh town near Hereford in the 1960s many other towns from all around the world have followed his example and joined the International Organisation of Book Towns. I had been to the ‘big’ book festival in the summer of 2009 once before the year I started the blog and had had an absolutely fabulous time, but had never made it to the winter edition until this year. It was exactly what I needed a month before Christmas: a few days away from it all in a cosy B&B surrounded by books, taking in the beautiful scenery, munching mince pies and sipping mulled wine like it was an Olympic sport AND a book festival on top of all that – genius! I had arrived in Hay on Friday night just in time for the big Christmas light switch-on with Ben Fogle in the centre of town. There was a little Christmas market in a sizeable tent by the Cheese Market and it was the first time this year I really felt like Christmas isn’t all that far off now. A little later that evening a lot of us gathered for music of a very different kind, the Ben Baddoo Afrobeat Band. It took place in the Castle, which is about to get an exciting makeover (more details below), one large room of which was nicely decorated with holly twigs, a real Christmas tree and a roaring fire in the corner. After a few minutes, the West African beats had everyone shedding their coats and dancing as if we were partying in much more sunny climes. Saturday morning started out well with an intriguing talk by Gruffyd Aled Williams about the significance of Owain Glyndwr in Welsh history followed by braving the pretty chilly temperatures on an equally fascinating guided tour of the now obsolete Hay Railway, which was in fact a narrow gauge horse-drawn tramway and was in operation from 1864 to 1962. After having checked out the pop-up stalls of the food festival and warmed up with some spiced apple cake and latte at the Old Stables Tea Rooms in the centre of Hay, it was time for another event, this time in St. Mary’s church. Ben Rawlence talked about his book ‘City of Thorns’, which describes life in the Dadaab refugee camp in northern Kenya and we also heard from Yohannes who made it to the UK from Ethiopia via the Libyan desert and Calais. Lots of food for thought about what home means to all of us, especially at this time of the year. I ended the evening with a lovely carol singalong in Hay Castle with more mulled wine, homemade mince pies and in good company. It was strange being in a small community such as Hay where nearly everyone knows each other and it felt at times almost like gate-crashing some sort of private celebration. I did meet a few others though who had come from further afield, such as London, like myself, Manchester and even Belgium to attend the festival. We all agreed we wouldn’t have wanted to be anywhere else that weekend. My Sunday began with an absolutely fabulous tour of Hay Castle (read up on its history and planned restoration on the Hay Castle Trust website) led by Mari Fforde. I’ve always loved how old houses preserve so much history over the centuries and was glad to see how passionate the local committee is about keeping their local history alive. It was a really dark, cold day, but thankfully the town centre was lit up by many beautiful lights, all the shop windows were lovingly decorated, there was a vintage festival on in town and many mugs of hot beverages waiting to be consumed by thirsty festival goers. After finally having had enough time to do a really good bookshop crawl (yessss! ), I attended my last talk of the weekend, ‘Browse: The World in Bookshops’, with the book’s editor Henry Hitchings who was interviewed by Hay Festival director Peter Florence (see picture below) in the Swan hotel, which was also the official festival HQ. The festival closing event at the Castle was another concert, this time with Australian born, Bristol based singer-songwriter Nuala Honan. Of course, there was more mulled wine and more lively conversation until it was time for the short walk back to my B&B and, alas, bye bye to Hay-on-Wye the following morning. Judging by the many sold out events of the weekend, the smaller, more intimate sister of the bigger Hay Festival is definitely a successful addition to the already existing roster of literary events in Hay. For me, it was the perfect booklovers weekend getaway and now I’m looking forward to Christmas even more! Hay also has a vibrant social media presence, if you’re into that kind of thing. Do check out the below twitter accounts for updates on events, foodie delights and more if you’re planning a visit: @hayfestival @HayHOWLs (to stop the closure of their local library!) @chefonrun @BoothsBookshop @childrnsbkshop @haycastle @HayMarketsLtd @4bruce7 @alanababycorner @marifromvalley @thestoryofbooks @haydoesvintage @broomfieldhse @haycheesemarket @Chris_the_Book @globeathay @Oxfam_at_Hay @thefudgeshop @OtherworldzHay @thefudgeshop and many more. An Evening with Jackie Kay Manchester-based writer Jackie Kay, is always a pleasure to listen to. The event at Halle St Peter’s was chaired by Rachel Cooke, who guided the conversation from Jackie’s childhood with her adoptive parents in Glasgow, to her early years as a young poet up to the present time becoming Scotland’s ‘makar’ (poet laureate) in March 2016 and planning a new project based on visiting all the Scottish islands (sounds fascinating!). There is always such an interesting contrast between Jackie’s bubbly, outgoing personality and her thoughtful, melodic poetry, often dealing with some serious subject matter. I was glad I picked up her memoir Red Dust Road, which chronicles the search for her birth parents in Scotland and Nigeria, after the reading. While the book is partly incredibly sad, it is a fascinating, multi-layered read, which is also extremely funny and honest. Al-Saddiq Al-Raddi This event was held at the Central Library and featured one of Sudan’s best known poets who has been based in the UK since 2012. After a bilingual reading of his poetry in Arabic and English, the writer was interviewed by author Travis Elborough. I’m always interested to learn about cultures I don’t know much about and languages I don’t speak. As a translator, this often reminds me of the language barriers that need to be overcome in order for different cultures to understand each other and poetry is definitely one of the most beautiful ways to accomplish this. Shetland with Ann Cleeves When I was visiting Glasgow for Celtic Connections last January someone recommended the TV series Shetland to me. Having never been a fan of crime dramas or novels, I reluctantly gave it a go, but was quickly hooked by it, like so many of us have been. So of course I jumped at the chance to see the author of the Shetland series, Ann Cleeves, in conversation with lead scriptwriter Gaby Chiappe and actor Alison O’Donnell, who plays Tosh in the series. The event (see image above) chaired by broadcaster Erica Wagner provided a fascinating insight into the writing and adaptation process and it was lovely to see how well the collaboration seems to have worked in this case. Literature-related museums and places: The John Rylands Library is part of the University of Manchester and the historic building dates back to 1824. I was even more impressed with a tour of Chetham’s Library (pictured above) the oldest free public reference library in the United Kingdom, which, together with the renowned school of music, was established as early as 1653. Not specifically literature-related, but well worth a visit is The People’s History Museum. It has some fascinating exhibits and brings the history of working people in Britain to life, right up to the present day. Second hand and comic bookshop Paramount Books, near the Shudehill bus station is a great place for stocking up on reading material about the city and further afield. Cosy cafes & pubs (with lots of veggie options): I ate at quite a few places during the weekend, which included The Earth Café (great veggie curry and desserts) in the basement of the Manchester Buddhist Centre. Another favourite was the fairly well hidden Nexus Art Café (cakes, coffee, snacks, see their courtyard above) as well as Common (extremely yummy veggie chili cheese fries). For a coffee or tea break you can’t go wrong with a visit to North Tea Power or Home Sweet Home. On Sunday night I headed to Odd Bar for a few drinks and some (by chance excellent) live Americana with The Wicked Path. I didn’t have enough time to make it to HOME and The Deaf Institute (they apparently do a great vegan hangover all day brunch on Sundays) this time, but did take a look at The Pilcrow Pub (see below), one of Manchester’s newest community ventures, which was largely built by volunteers (how cool is that?!). The good thing about living in London is that hardly a week goes by without a writers festival happening somewhere around the city. Not all of them take place in such a wonderful bookshop and are as lovingly curated as the Daunt Books Festival in Marylebone, however. 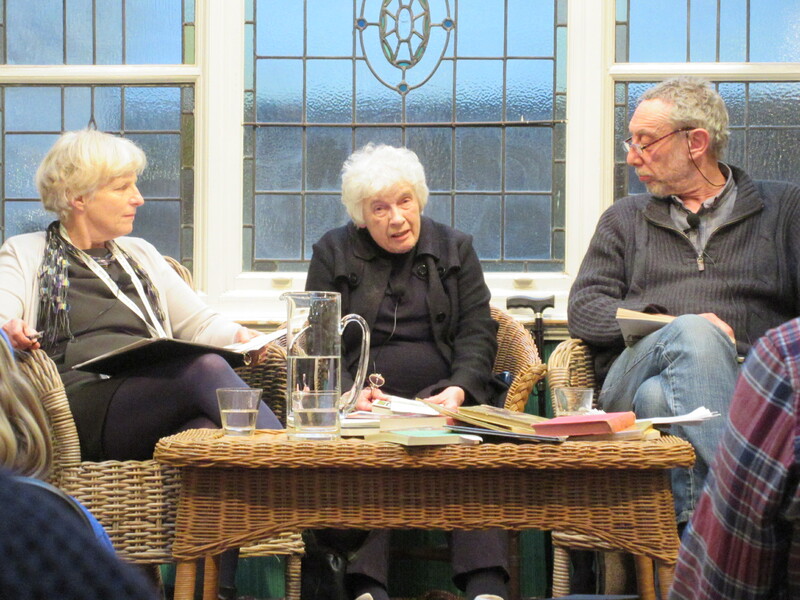 For the second festival on 19-20 March 2015, bookseller and organiser Emily Rhodes put together an enticing programme of talks and discussions for all ages. I would have loved to be at all the events (smaller scale festivals with only one event at a time are great as no clashes), but sadly work commitments got in the way. The talks I did catch were excellent though. On Thursday I was lucky to be at a conversation between former children’s laureate, novelist and poet Michael Rosen and one of the top literary translators in this country, Anthea Bell (mainly from German and French), chaired by Julia Eccleshare. The topic was loosely based around fascinating German author Erich Kästner’s work, but also covered various other childhood favourites in translation. You can listen to a podcast of Rosen visiting the Berlin of „Emil and the Detectives“, a Kästner classic originally published in 1929, which was also recently made into a successful Westend production, here. Even just looking at the different covers from various past English editions of the popular children’s book translated from German was fascinating. So was the discussion on the German and English film adaptions of the book. Compared to existing children’s literature of the time, it was a groundbreaking novel and the only one of Kästner’s pre-1945 works to escape Nazi censorship. On Friday I started my book festival day with some delicious spiced hot chocolate from Roccoco chocolates before the first author event of the day: In Praise of Short Stories. I love short stories and far from being in any way inferior to the novel as a literary genre, they have their own appeal. There are even specific short story festivals, such as the London Short Story Festival or the Cork Short Story Festival in Ireland. My third and last event of the festival was Russians in Paris, about émigré Russian writers of the 1920s and their influence on Russian and foreign literature. Translator and editor Bryan Karetnyk, author Peter Pomerantsev and literary critic and writer Nicholas Lezard discussed Russian literature past and present, the relevance of Paris as a base for so many writers in the 1920s (including the fact that most Russian émigré writers had excellent French) as well as the freedom which a move to another city and country can bring to one’s work. I had never read any books by Gazdanov or Teffi before, the talk definitely piqued my interest in Russian writing, however. Luckily, there are UK publishers who specifically focus on the world’s literature in translation. 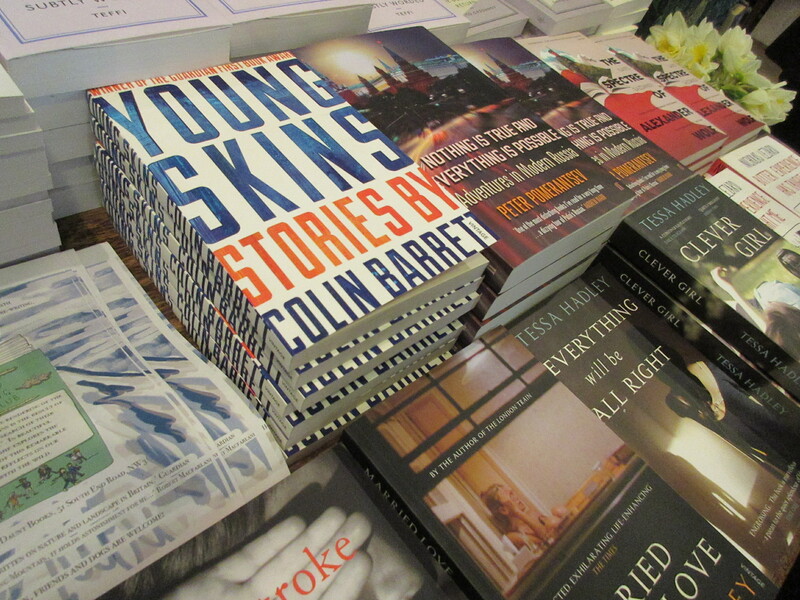 These include And Other Stories, Pushkin Press and Peirene Press and Daunt stocks quite a few of them. If you have caught the translated literature bug and are keen to read more books from cultures around the world in translation, you can take a look at @TranslatedWorld as well as hashtags #TranslatedWorld and #NameTheTranslator on Twitter for excellent suggestions. There is also a useful calendar of literature translation related events (mainly in the UK). Thanks to Emily for being so welcoming and for answering all my questions on festival programming, preparations and her other bookish adventures. You can read my interview with her here and are welcome to join her monthly Walking Book Club in London. Festivals are all about people and creativity. In a new series of interviews we ask some of our favourite “makers” to tell us a little more about their creative projects, inspirations and passions. First up is Emily Rhodes, director of the Daunt Books Festival. 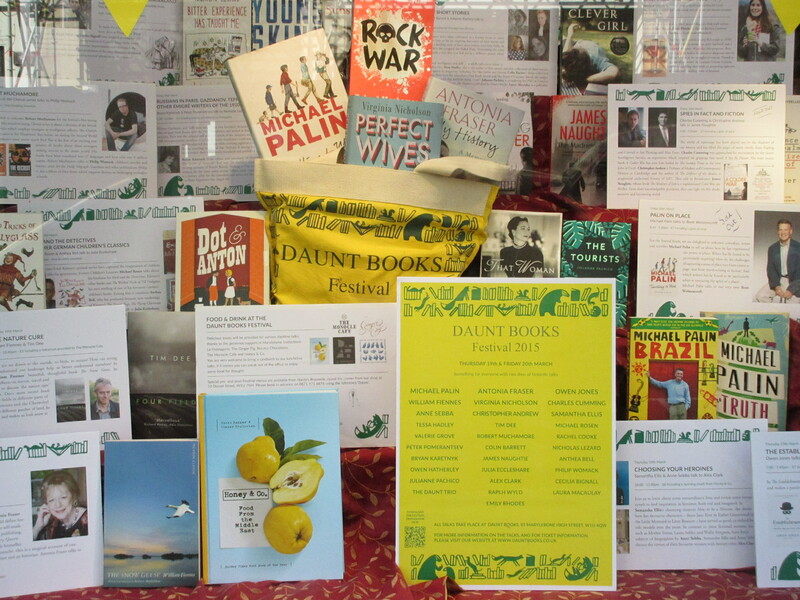 Life is a Festival: It’s the second year of the Daunt Book Festival and after a successful first year the line-up for 2015 looks very promising again. How did the festival come about in the first place and how did you get involved personally? Emily: Thanks! 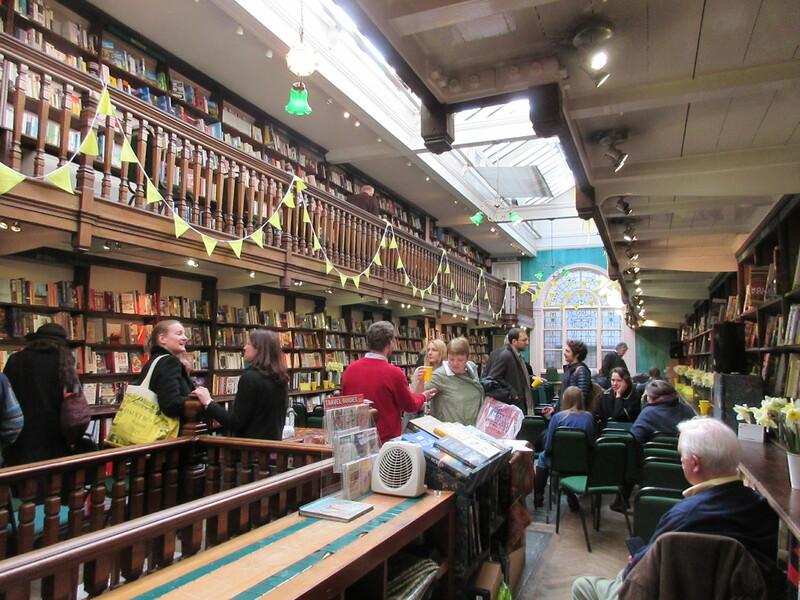 I’ve been bookselling at Daunt for a few years and love the lively atmosphere of our literary talks … so I thought why don’t we have a whole festival? It would be so much fun! Everyone seemed keen on the idea, so then it was just a case of making it happen. Life is a Festival: There is a lot of work which goes on “behind the scenes” to make a festival happen. Who else is involved and how long do the preparations take? Emily: We couldn’t do it without the wonderful support and encouragement of so many publishers and authors – if everyone I asked to take part said ‘no thanks’ then we wouldn’t have much of a festival. The Howard de Walden Estate were also behind it from the start and great at putting me in touch with people and helping to make it so Maryleboney. I began thinking about the line up in August-September, but even before that were the beautiful limited edition bags to sort out with Re-Wrap and the brilliant designer Will Grill, who came up with this year’s fun, playful design. Life is a Festival: How do you go about choosing authors for the festival programme and matching the right writers and interviewers to get a good discussion going? Emily: It’s a bit like planning a party – I think of all the authors and critics I would like to see (and who I think our customers would like), think about what they might have in common, and match them up. I also look at what new books are coming out and see if I can draw out any common themes for discussion. It’s always fun when you get authors embarking on a larger conversation about what they’re passionate about rather than just summarising their books, so the chemistry between speakers is vital. Life is a Festival: Are there any personal favourites you are especially looking forward to this year or are particularly excited to have secured for the 2015 line-up? Emily: Ummm… all of it! I’m especially thrilled to have got Michael Palin on board. He is in such demand, so it was lovely to think that the shop meant enough to him to get a yes. I am also very excited about the opening ‘choosing your heroines’ event with Samantha Ellis, Anne Sebba and Alex Clark – a great chance to think about some inspiring women; oh and Owen Jones and The Nature Cure … there’s lots and lots to look forward to. Life is a Festival: Finally, you run a very popular “walking book club”, tell us a little more about this unique project and your book blog EmilyBooks. 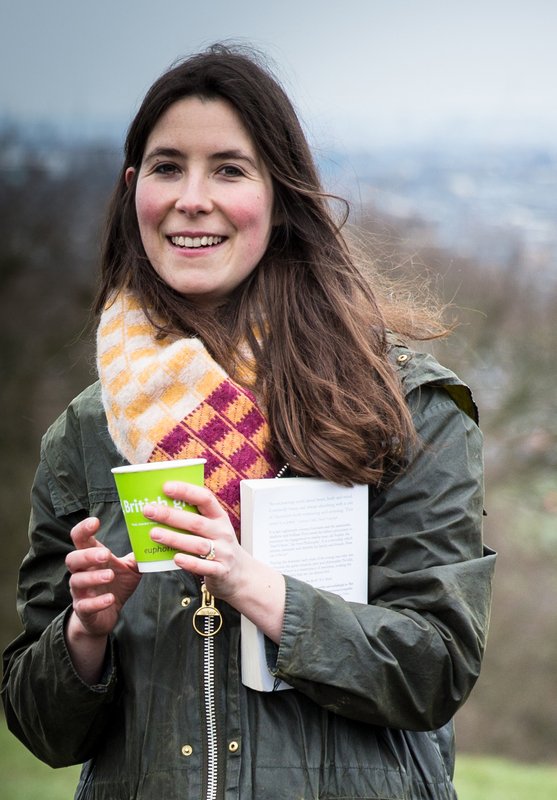 Emily: I love walking and I love reading; working in the Daunt’s right by Hampstead Heath, I realised rather a lot of our customers felt the same, so I thought why don’t we go for a walk on the Heath and talk about books? So we did. It’s really taken off, I think because it’s so much easier to talk when walking side-by-side with everyone, looking at such amazing views and getting all that fresh air, and it means that nobody can dominate the discussion as there are so many conversations going on at once. I love it! It’s also a good chance to highlight some older books – many of which risk falling of the reading radar, slightly correcting the usual reading/bookselling focus of sticking to those which are newly published. And I started my blog because I wanted to give myself the space to think about everything I read – like a reading diary. Then it was a very pleasant surprise to find that other people read it, and to build up some connections with like-minded bloggers. 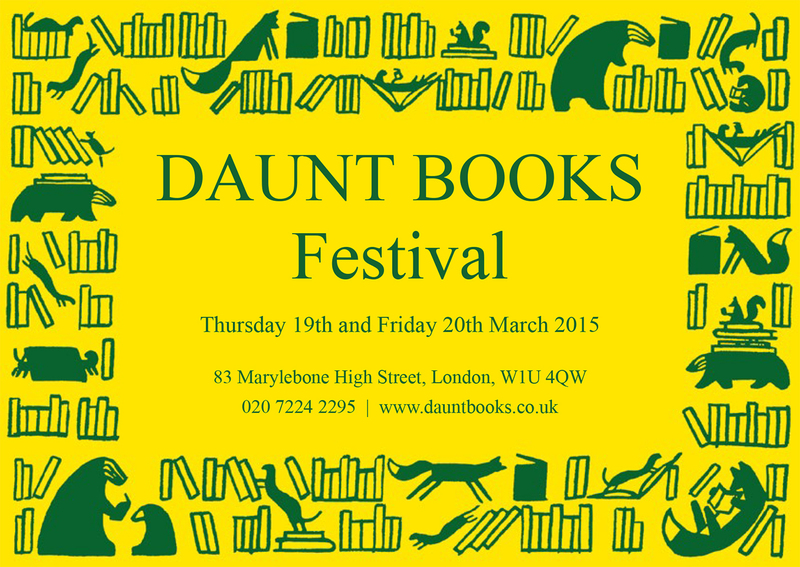 Thanks very much to Emily Rhodes for the interview and check out Daunts Book Festival, which takes place in London 19-20 March 2015.